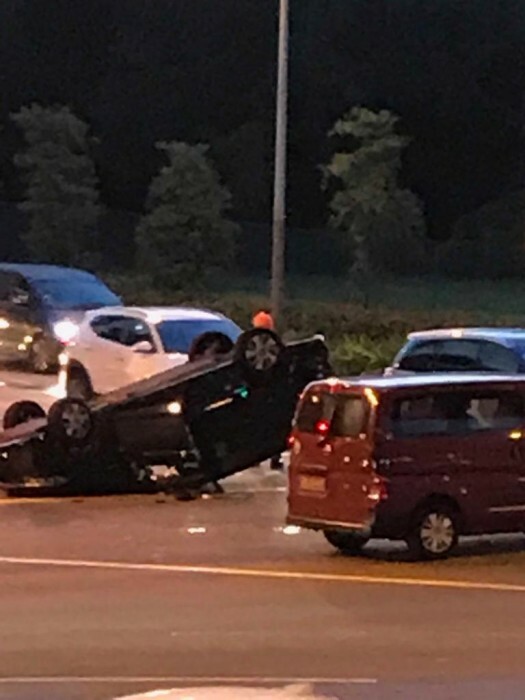 A blue car flipped over after a collision with another vehicle at the junction of HarbourFront Avenue and Telok Blangah Road yesterday (Dec 3) at about 6.57pm. Several Stompers sent in pictures and videos they captured while passing by the scene of the accident. Stomper Mohd was on his way home from work at about 7.30pm, when he recorded the aftermath of the accident on his phone's camera. In the video he sent, the overturned car can be seen on his left, taking up two lanes of the road. He told Stomp: "There was a jam along the whole stretch of road because of the accident. "The accident took up two lanes of the road and vehicles could only travel on one of the lanes, because the other is a bus lane. "Usually, it takes five to six minutes for me to cross that stretch of road, but that time it took nearly 20 minutes." Another Stomper sent in a video she captured. In the video she sent, a tow truck and the overturned vehicle can be seen at the accident site. There are officers keeping motorists away from the area, where the accident took place. The video ends with the tow truck beginning to move the overturned blue car. Stomper Anonymous shared photos of the accident which were forwarded to him in a group. One of the pictures shows the overturned car and a red van. Stomp understands that a motorist saw a red van ram into a blue car that was turning into HarbourFront Avenue. According to the motorist, the driver of the blue car managed to crawl out of the car.